Muirmailing Cottage is a delightful, semi-detached property located next to the owner's home and small, family-run plant nursery. Located in Plean, over 5 miles from Stirling, this cottage sleeps four people in two first floor bedrooms, each with double beds that can be converted into twins on request. There is also a first floor bathroom, a ground floor shower room, a kitchen with dining area and a sitting room. Outside, there is off road parking for two cars plus a patio garden with furniture, offering far-reaching views. 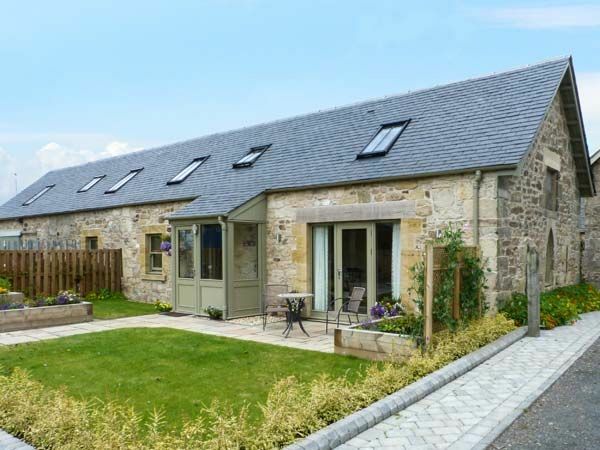 Muirmailing Cottage sits in a fantastic location for touring this vibrant and varied area of Scotland, and with its flexible sleeping, it's perfect for almost any group. Note: Mobile phone signal is variable at this property. Note: Sloping ceiling and reduced head height in bedrooms. Note: There are two ponies in the field around 300m from cottage. Amenities: Central heating from air-source heat pump with underfloor heating on ground floor. Electric oven and induction hob, microwave, fridge/freezer, washer/dryer, dishwasher, TV with Freeview, DVD, iPod dock, WiFi, selection of books, games and DVDs. Fuel and power inc. in rent. Bed linen and towels inc. in rent. Cot, highchair and stairgate on request. Off road parking for 2 cars. Front patio with furniture. Sorry, no pets and no smoking. Shop and pub 1 mile. Note: Mobile phone signal is variable at this property. Note: Sloping ceiling and reduced head height in bedrooms. Note: The owners have 2 cats and 2 dogs, and there are two ponies in the field around 300 yards from cottage. No work parties accepted at this property, only holiday makers. Note: This property only accepts a maximum of two children, this is inclusive of infants. Town: Stirling is Scotlands youngest city and yet one that has so much ancient history from William Wallace to Robert the Bruce. Stirlings history is evident today in the Old Town, which boasts family ghost walks and tales from the graveyard. Stirling Castle has a superb, dramatic cliff-top location overlooking the city and provides a stunning outlook from its battlements to the mountains, cliffs and River Forth snaking away to Edinburgh. Two double bedrooms (zip/link, can be twin on request). Bathroom with bath, shower over, basin and WC. Ground floor shower room with shower, basin and WC. Kitchen with dining area. Sitting room. Central heating from air-source heat pump with underfloor heating on ground floor. Electric oven and induction hob, microwave, fridge/freezer, washer/dryer, dishwasher, TV with Freeview, DVD, iPod dock, WiFi, selection of books, games and DVDs. Fuel and power inc. in rent. Bed linen and towels inc. in rent. Cot, highchair and stairgate on request. Off road parking for 2 cars. Front patio with furniture. Sorry, no pets and no smoking. Shop and pub 1 mile. Note: Mobile phone signal is variable at this property. Note: Sloping ceiling and reduced head height in bedrooms. Note: The owners have 2 cats and 2 dogs, and there are two ponies in the field around 300 yards from cottage. No work parties accepted at this property, only holiday makers. Note: This property only accepts a maximum of two children, this is inclusive of infants. Lovely, clean and complete. We could not think of a more perfect little house. Very comfortable, and perfect location to go to Stirling and Edinburgh. Alles in Allem aber wirklich nur zu empfehlen!